I'm suing Centerplate, the food-service company of Super Bowl 50. I Sold Concessions at the Super Bowl. Now I’m Suing for the Workers Whose Wages Were Stolen There. 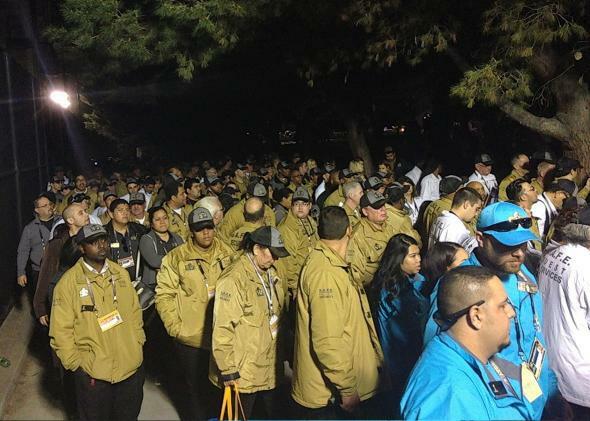 Workers wait in line for shuttles after Super Bowl 50. On Wednesday, in the Superior Court of Santa Clara County, California, attorney Caren P. Sencer of Weinberg, Roger & Rosenfeld filed a lawsuit against Centerplate, the company that provides food and beverage service at Levi’s Stadium, recent host of Super Bowl 50. Among the allegations in the complaint is that Centerplate did not pay employees for all hours worked, failed to grant rest breaks as required by California law, and engaged in unfair business practices. The lawsuit, if granted class status, would cover all Centerplate employees at Levi’s Stadium who worked during the 2015–16 NFL season. I worked for Centerplate at Levi’s Stadium during four games, including the Super Bowl. My post was inside the Yahoo Fantasy Football Lounge, one of the stadium’s 10 “premium club areas.” As I wrote in Slate—in a story reported in partnership with the Nation Institute Investigative Fund—I was often not given rest breaks, even during shifts that exceeded 12 hours. And on the day of the Super Bowl, Centerplate failed to pay employees for the time they spent waiting in line for—and traveling on—employee shuttles to and from the stadium. Those hours added up: Of my 17-hour shift, five of them were spent waiting or in transit. According to California law, these hours should have been on the clock. For many workers, wage theft is routine. In 2009, a study by three organizations—the UCLA Institute for Research on Labor and Employment, the National Employment Law Project, and the University of Illinois at Chicago Center for Urban Economic Development—found that low-wage workers in Chicago, Los Angeles, and New York City lost more than $56 million per week due to various forms of wage theft and other forms of labor violations. Last October, California Gov. Jerry Brown signed legislation that makes it easier for workers to recover back wages, including a provision that holds individual executives, and not just the corporate body, accountable for unpaid wages. Along with Centerplate, the lawsuit names Chris Verros, the company’s president and CEO, along with several other executives.